There’s a reason why we’ve posted about over 80 clocks on CG, clocks make pretty cool gadgets. This next one, the Wall Gear Clock, is probably as different as they come. The hands are gears that slowly move around the clock as time passes. 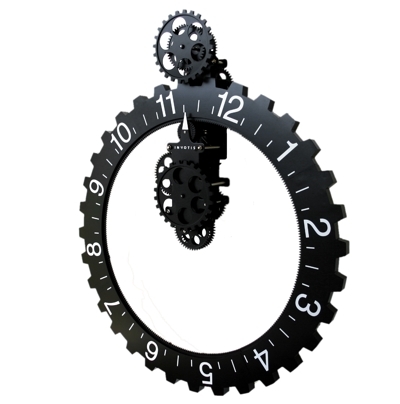 A fascinating and novel wall clock which is brand new to the market place, the gears all spin around slowly and quietly creating a very eye catching unique clock and at over 56cm wide makes a real centre piece in any room. The clock is ideal for the modern home where something a bit different is required. Generally the construction is high quality black plastic with some metal components. The Wall Gear Clock is available from Contemporary Heaven for £78 (~$150).